The changes have been coming fast & furious to Google+ and Facebook over the past week, as the social media arms race really heats up. First, Google+ invited everyone to join and introduced Hangouts, +Search, an improved mobile app, and several other enhancements. Early reaction has been positive, giving Google hope that + might yet achieve the critical mass necessary to become a viable social competitor to Facebook, and not just an interesting upstart. Facebook responded with their own take on Google+ Circles, added a Subscribe option, and much to the chagrin of the change-resistant masses everywhere, had the gall to reorganize users’ feeds yet again. And – as of about an hour ago – announced the even bigger Apps and Time at their f8 conference. As someone who spend a LOT of time in AdWords, I’d like to focus on one of the under-the-radar changes that could have a profound effect on display advertising: Google announced that they would be adding +1 counts and friends’ recommendations to ads on the display network. +1 counts and friend recommendations will be shown at the bottom of display ads, and then fade out until the user mouses over the ads. It seems safe to assume that an ad with a large number of +1s, especially from Google+ friends, will see a much higher click through rate than one without. What’s more, AdWords will be serving +1’d ads to users across the display network, regardless of keyword or placement targeting (yes, placement exclusions will still be respected) — in essence, de facto retargeting. Expect to see a greater variety of display placements. 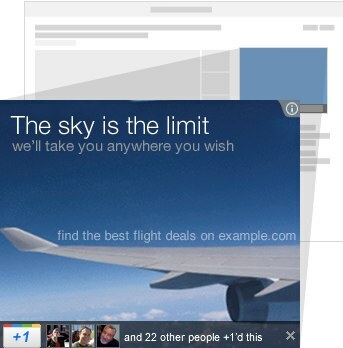 Seemingly off-topic placements may now be recommended ads following people around the Web. Expect to see click through rates rise. Or fall, if your competitors are piling up +1s and you’re not. You need to build a +1 strategy into your display campaigns. Google makes it sound like – though more research is in order – +1s are associated with destination URLs, rather than individual ads or ad groups. Which means it should be possible to smartly consolidate your +1s, but it may require you to dial back on landing page variations. Expect people’s relationships with display ads to evolve. While the potential to creep people out is certainly there, a well crafted display campaign now has a better chance of becoming more than just visual background noise by actually informing a user’s reaction to page and ad content based on +1 recommendations.